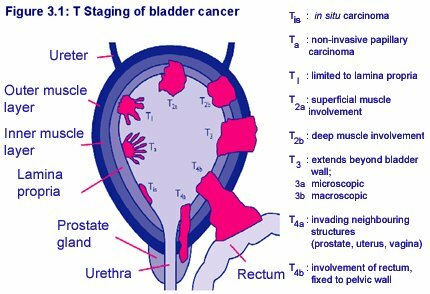 Bladder cancer will kill upward of 170,000 people worldwide this year, but bladder cancer isn’t fatal in the bladder. Instead, in order to be fatal the disease must metastasize to faraway sites. The question has been this: does localized, non-muscle invasive (NMI) bladder cancer eventually become the more dangerous, muscle-invasive (MI) form of the disease, or are NMI and MI bladder cancers genetically distinct from the start? A University of Colorado Cancer Center study published today in the journal Stem Cells shows it’s the latter: the progenitor cells that create MI bladder cancer are different than the progenitor cells that create NMI bladder cancer. Though these two cancers grow at the same site, they are different diseases. “This work provides an important new perspective on how we look at bladder cancer biology,” says Dan Theodorescu, MD, PhD, director of the University of Colorado Cancer Center and the study’s senior author. The group including first author Garrett Dancik, PhD, genetically profiled two cell types that could give rise to bladder cancer - the basal and umbrella layers of the normal bladder lining (urothelium) - to discover the gene signatures specific to each of these cell populations. Then the group compared these gene signatures to human bladder cancer samples. The tumor samples were distinct: those with the signature of umbrella cells were likely to be lower stage and patients eventually had favorable outcomes; tumors with the signatures of basal layer cells were likely to be higher stage and patients eventually had worse outcomes. Bladder cancer is the sixth leading cause of new cancer cases in Canada each year. It is diagnosed 2 to 3 times more often in men than in women, and it is seen in Caucasians twice as often as those of African descent. It’s the fourth most common cancer among American men, the ninth most common in women. “We saw a fairly stark difference between these tumor types: those with basal signatures were distinctly more aggressive than those with umbrella signatures,” Theodorescu says. In fact, these signatures predicted tumor stage and patient survival better than many existing prognostic markers. “Our results suggests that NMI cells arise from non-basal cells, whereas MI tumors arise from basal cells,” Theodorescu says. This work was supported in part by National Institutes of Health grants CA075115 and CA104106.